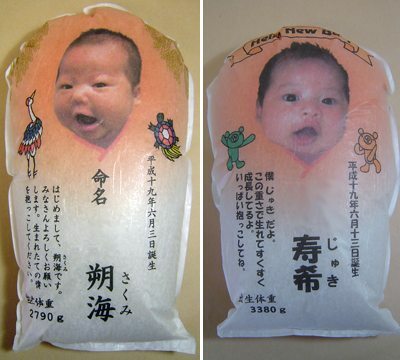 To celebrate the birth of a baby in a way that makes it feel like the kid's right there in your arms, a rice shop in the southwestern Japanese city of Kita-Kyushu will send out a customized dakigokochi, a roughly baby-shaped bag of high-grade rice to everyone on your birth announcement list. 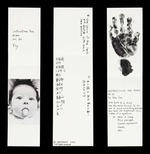 The bag will be printed with the kid's picture, stats, and a greeting--and it will weigh the same as the kid did at birth. Depending on the type of rice, dakigokochi run about 3200-4200 yen, plus 640-1000 yen shipping, so $US35-45/each. There are eight bag colors and approximately one million traditional wrapping options [so Japanese], though I didn't check if there's a price differential. They only ship within Japan. For the more traditionally minded, there is the kotobuki dawara, an OG straw bale container of rice which is filled to match the birth weight of the baby. 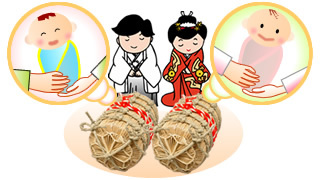 It's also suggested as a favor for wedding guests and/or the parents of the marrying couple, in which case, you give one each with the birth weights of the bride and groom. It's meant to symbolize the cycle of life, as the grains of rice are borne of the stalk--and then steamed and eaten? Am I missing a step? Those rice bags look spooky to me, like the baby's floating in a life jacket, going, "Help!" dorothy is right about the life jacket effect, that was the first thing I thought of when I saw these. I like the rocket propelled turtle on the bag on the left. Maybe he's on the way to rescue the life jacket baby. I love the life jacket effect. It's even better if you imagine a little, "Help me!" like in The Fly. Rocket Turtle is the new name of my Guitar Hero III band, now. 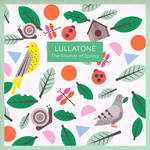 I'd love to get this for our latest addition, due in August. Too bad it's Japan only. OMG! They really look like chinese tomb stones.